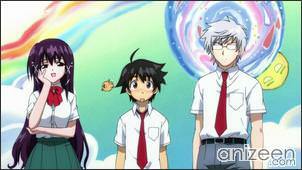 Tomoki Sakurai’s peaceful life is far away in the past, he has to deal with two angeloids, Ikaros and Nymph, along with his friends from school, each one of them very special on their own ways. Tomoki’s dream about an angel warning him from the rage of heavens is getting very common at his sleep, then one day a new angel who has power up to the standar of Ikaros arrives Earth with the sole purpose of terminating Tomoki since his dream is starting to connect both realities, the Earth and the Synapses, a very powerful angel indeed. 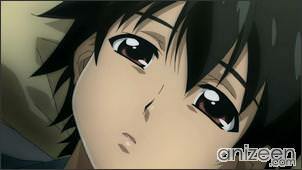 In Sora no Otoshimono: Forte, once again, Tomoki finds himself plagued by strange dreams which he can hardly remember after waking up. Though the rest of his life has returned to a semi-normal pace, these dreams continue to haunt him. 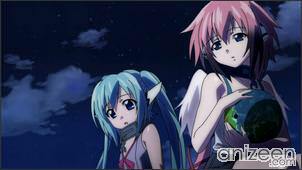 Ikaros and Nymph offer to use one of the powers issued to them by Synapse to gain access to Tomoki’s dream so that some sense might be made of it. Tomoki and his friends have to do the dirty work, though; Angelroids can’t have or see dreams themselves. Tomoki and his friends are sent to the worlds of various dreams; Nymph can’t quite get the coordinates correct at first, so the group is treated to varied and rather embarrassing dreams of their own, before settling into Tomoki’s mind. Tomoki insists that the dream isn’t his, what with the gray ground, leafless trees, and strange obelisk, but Nymph insists that it must be his. Tomoki’s friend Sugata is left to ponder the ominous imagery of the dream while another angelroid crashes to earth with a mission. Tomoki Sakurai wants nothing more than a peaceful and quiet life in town. 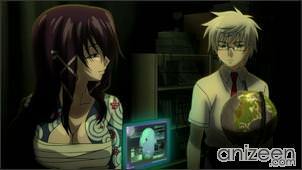 However, Tomoki’s life is forever changed when he meets with Ikaros. 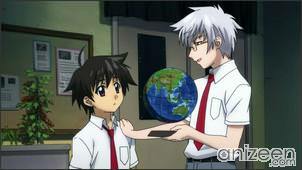 While Tomoki has an extremely perverted side, he is usually a kind and sincere person. He takes on the task of helping Ikaros become more human. He has a re-occurring dream where he loses his angel. Sohara Mitsuki is Tomoki’s childhood friend who lives across the road from him, often goes to his house in the morning to wake him up. As a child she was constantly ill and thus had few friends. 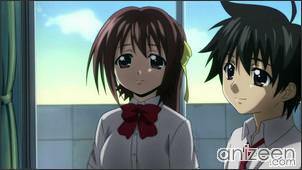 She is continually jealous of Tomoki’s relationships with the various Angeloids and generally acts on this jealousy by “Karate-Chopping” Tomoki. 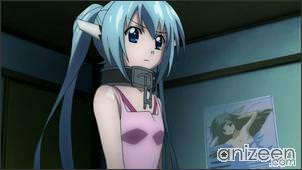 Nymph is an “Electronic Warfare Angeloid, Type Beta” who mysteriously appears in Tomoki’s house. She is condescending towards humans, whom she refers to as “bugs”; this is no doubt a result of her former master’s constant belittling of humans or as he calls them, “Downers”. After she spends time with them, she realizes the error of her ways and starts to treat them as equals. Sora no Otoshimono: Forte (そらのおとしもの f （フォルテ）) also known as Heaven’s Lost Property, is a Japanese manga series written and illustrated by Suu Minazuki. The manga began serialization in the May 2007 issue of Kadokawa Shoten’s manga magazine Shounen Ace, and as of September 2010, nine bound volumes have been released in Japan. 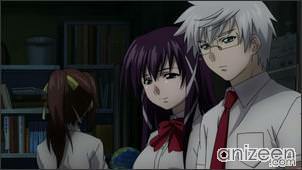 The first episode of the second anime season aired on October 1, 2010. Ending Theme: “Kaeru Kara” by blue drops; “COSMOS” by blue drops; “Kakemeguru Seishun” by Mina and Ayahi Takagaki; “Miracle Guy” by Kaori Fukuhara; “ff (Fortissimo)” by Mina; “Soldier in the Space” by Soichiro Hoshi and Tatsuhisa Suzuki; “Kaerazaru Hi no Tame ni” by Soichiro Hoshi, Saori Hayami, Mina, Tatsuhisa Suzuki, Ayahi Takagaki, Iori Nomizu and Kaori Fukuhara; “Odoriko” by Saori Hayami and Ayahi Takagaki; “Natsu no Ojō-san” by Iori Nomizu; “Boukyou no Tabi” by Soichiro Hoshi and Saki Fujita; : “Jidai Okure no Koibito-tachi” by Saori Hayami, Iori Nomizu and Kaori.